As always, the London Jewish Chronicle (JC) is providing us with an accurate insight into Jewish influence within the media and beyond. The JC is desperate to stop my book, The Wandering Who -- and it is also foolish enough to disclose its tactics, openly revealing to us the pressure which some elements within the Jewish community are willing to mount on Britain’s leading newspapers and other outlets. And yet, it seems that no one in the Jewish Chronicle has read the book, or any of my writing -- otherwise it is hard to explain why the JC keeps labeling me as an ‘anti-Semite’ or a ‘racist’. Had the JC actually bothered to read my writing or taken the time to follow my speeches and debates, they would have realised that there is no trace of ‘racism’ or ‘anti-Semitism’ in my work: yes, I am critical of Jewish politics; yes I am an opponent of Jewish political power, and yes, I follow my duties as a humanist to expose Jewish identity politics for what it really is. This fact alone may explain why my book is supported by respected humanists and some of the most distinguished academics, all of whom are held in high regard in their fields and beyond. I actually seem to be slightly kinder to Aaronovitch, Cohen, Levy, Saban, Wolfowitz, Freidman, Sharon, Peres, Livni, Greenspan, Foxman and many others: I am happy to agree that they were hijacked by a lethal ideology or culture rather than being consciously sinister. I think that The Guardian should indeed review its policy -- and the sooner the better. When I settled in this country seventeen years ago the ‘Left’ paper was regarded by many as the ‘guardian of the truth’, and yet it seems as if, in the last few years, this paper has deteriorated into a guardian of Zionist interests. This, explains for instance, The Guardian’s dubious relationship with Wiki leaks, and it explains why the paper failed to publish leaks concerning Israel. In a recent Counterpunch expose, Jonathan Cook elaborated on the Guardian as an increasingly Dangerous Cult. However, I still want to believe that The Guardian will find within itself the powers to liberate itself from its current masters, for now, more than ever, we need in this country a brave, egalitarian critical outlet rather than yet another Zionist submissive mouthpiece. 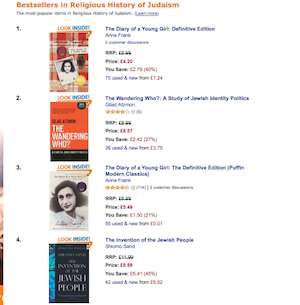 And now here is the good news: it seems as if the JC/Guardian joint efforts to stop ‘The Wandering Who’ have been totally counterproductive, for according to Amazon, The Wandering Who is number 2 on the ‘Bestsellers in Religious History of Judaism’ list. This morning, number 1 is Anne Frank’s The Diary of a Young Girl; number 2 is The Wandering Who; Number 3 is Anne Frank Again (different edition) and Number 4 is Shlomo Sand’s The Invention of the Jewish People. It is not a coincidence. As it happens, The Wandering Who is there to locate Anne Frank within the context of the phantasmic invention of the Jewish people. By now, it should be clear to both The Guardian and the JC that their joint attempt has failed. But far more interesting is the fact that their failure is just another symptom of their growing intellectual irrelevance. If some Jewish people still insist on regarding themselves as ‘the people of the book’, they should stop wasting their time, and they should start to engage in a dialogue with my text rather than trying to burn it. If Jews insist that I am misguided and wrong, they would be better off showing some tolerance and joining in the open debate. I wish them luck -- but I don’t hold my breath.